Samsung Galaxy S death grip? Hmm.. i think it not just iphone 4 which has a death grip.. “you hold the iphone in the wrong way”, said Steve Jobs.. But, look at this video below… Samsung Galaxy S has the same problem with iPhone 4… any comment? Posted in Android, iPhone and tagged death grip, drop signal, iphone 4, samsung galaxy s. Bookmark the permalink. 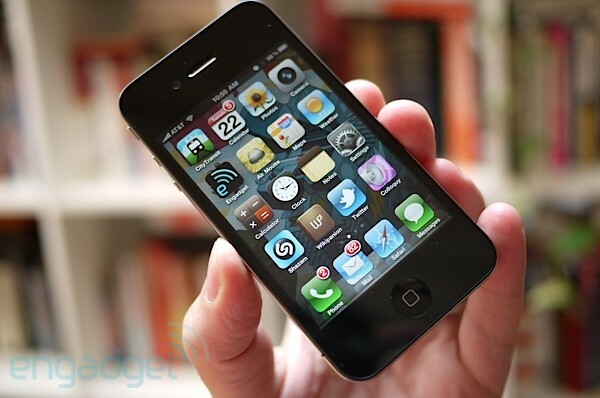 iPhone 4 Death Grip Reception Problem to be Fixed Monday Via iOS 4 Patch? 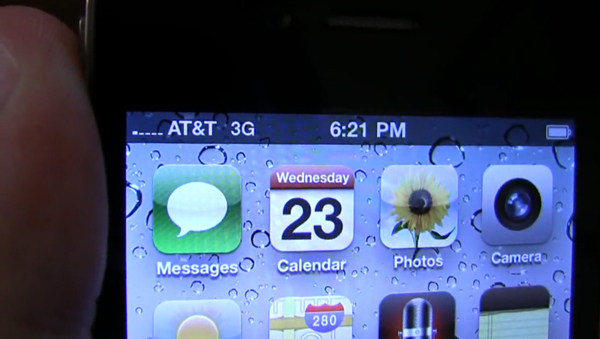 iPhone 4 that was released this week has been plagued by reception drop-offs if the phone is held a certain way (a.k.a the Death Grip), likely due to the antennae assembly wrapping around the device. While that seems like it’s primarily a hardware issue, others had found that their older iPhones that had updated to iOS 4 had the same problem, potentially that there’s nothing necessarily wrong with the iPhone 4′s inherent design, but there’s simply a software-based bug.That being said, there are rumours floating from the Apple technical support forums that as early as Monday, iOS 4.01 will be released which will fix the problem.So what exactly was the issue, if it wasn’t the hardware? Apparently iOS 4 introduced a new way of picking and choosing wireless frequencies to use, based on noise and signal strength. Clearly something wrong happened there, resulting in the phone opting to find no service at all rather than switch up. Looking at the results of our poll, the Death Grip is far from an isolated incident, and runs rampant on just about every iOS 4 device. Hopefully the baseband will be updated soon, so folks can get back to enjoying that crisp Retina display, 5 megapixel camera with flash, and oodles of apps without having their calls drop and data cut off. Dikabarkan memang sebelumnya iphone 4 mempunyai kelemahan dalam hal mencari signal pada saat iPhone 4 dipegang seperti biasanya. Namun ada lubang kecil hitam yang tertutupi oleh tangan si pengguna. Hal inilah yang menyebabkan signal iPhone menurun secara perlahan-lahan. Selain itu juga menyebabkan terjadinya drop call saat sedang menelpon. Dikabarkan, Apple akan mengeluarkan update iOS 4 .01 pada hari senin mendatang. Apakah kelemahan ini terdapat pada software? Dan bukan pada hardware? Kita tunggu hasilnya mendatang. Posted in iPhone and tagged drops, iphone 4, reception. Bookmark the permalink. Steve Jobs show us how to hold the iPhone 4 in the right way..
Posted in iPhone and tagged antenna problem, grab, holding, iphone 4, signal degradation, trasmission. Bookmark the permalink. 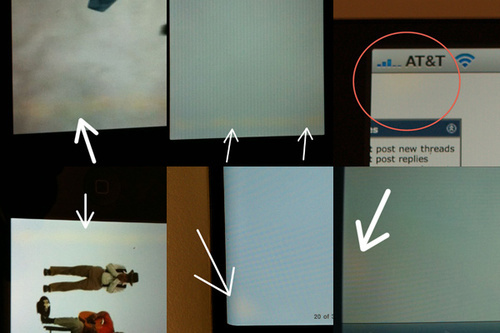 There is a problem with the iPhone 4’s Retina displays: Some screens have a yellow tint across its surface. 19 cases [Updating Live] and counting. In some, it’s a yellow band. In others, yellow spots. Posted in iPhone and tagged band, dicoloration, display, iphone 4, spot, yellow. Bookmark the permalink. The iPhone 4 is no small thing to review. As most readers of Engadget are well aware, in the gadget world a new piece of Apple hardware is a major event, preceded by rumors, speculation, an over-the-top announcement, and finally days, weeks, or months of anticipation from an ever-widening fan base. The iPhone 4 is certainly no exception — in fact, it may be Apple’s most successful launch yet, despite some bumps on the road. We’ve already seen Apple and AT&T’sservers overloaded on the first day of pre-orders, the ship date for the next set of phonespushed back due to high demand, and die-hard fans in line outside of Apple locations a week before the phone is actually available. It’s a lot to live up to, and the iPhone 4 is doing its best — with features like a super-fast A4 CPU, a new front-facing camera and five megapixel shooter on the back, a completely new industrial design, and that outrageous Retina Display, no one would argue that Apple has been asleep at the wheel. So the question turns to whether or not the iPhone 4 can live up to the intense hype. Can it deliver on the promises Steve Jobs made at WWDC, and can it cement Apple’s position in the marketplace in the face of mounting competition from the likes of Google and Microsoft? We have the answers to those questions — and many more — in our full review, so read on to find out! Posted in iPhone and tagged iphone 4. Bookmark the permalink. Adding to yesterday’s release of redsn0w beta, PwnageTool 4.0 was set free this afternoon and promises to jailbreak/hacktivate devices provided a specific set of criteria are met. If you want to get really fancy, you can also use a special version of ultrasn0w to unlock your iPhone, but again, this is dependant upon certain things being just so. We’ve got everything you’ll need to get the job done queued up, so don’t be afraid to hit up the jump get get started. Happy jailbreaking! Posted in iPhone and tagged PwnageTool. Bookmark the permalink. The official packaging of Apple’s iPhone 4 has been revealed days before the product is set to launch, thanks to a photo taken at a Walmart where the devices have already arrived.